On any good vacation, we needed to have our fill of sweets, sugars, and desserts. Each night after dinner, we stopped by a dessert place to slow down and enjoy some sweets and rest our legs. Here are some of our favorite dessert stops in Boston and the surrounding areas. Many of these are nearby to dinner spots or other tourist locations. L.A. Burdick is a high end creator of handmade chocolates. The high end chocolate are melt in your mouth goodness. The chocolate is shaped into various animals like cute bees, mice, and elephants. The chocolate is so smooth that the chocolates begin to melt in your hand. It’s better not to touch the chocolates with your fingers. We ended up buying individual pieces to enjoy throughout our time in Boston and a few small boxes as gifts. Toscanini’s Ice Cream is a popular gourmet ice cream stop near the MIT campus, between Central and Kendall. Similar to many other ice cream parlors that make their own ice cream, this stop had a more selection than average. It’s a large ice cream shop, but with a long line. There are some available seating, but most people take their ice cream to go. 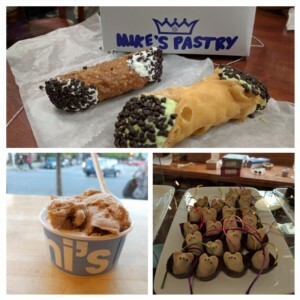 Mike’s Pastry is the highest rated cannoli dessert in the area, in the North End of Boston. I have never had a cannoli, but had to try this shop. After trying it, I now know I am not a huge fan of the cannoli. The way I describe my first cannoli is a very dry and dense whipped cream wrapped in a thin layer of crispy fried pasty. The cream isn't too sweet, which is a plus. But I wasn't particularily a huge fan of the cannoli. The place was busy, and most of their business is take out. There are a few tables off to the side and we were lucky to snag a seat to enjoy our cannoli.